It’s that time of the year where the city is dressed up in pretty lights and our hearts are overwhelmed with festive joy and spirit. This Diwali, ditch the cliche last minute gifts to celebrate happiness and love with Brookside's festive gift box with dark cocoa-rich chocolate in exotic fruit flavors to treat your family & friends. Diwali calls for new beginnings, creating great memories & pampering our sweet tooth. Over the years, Diwali celebrations have added a touch of modernity to tradition. So, should one stick to the same old box of pedas and ladoos as gifts? Opt for this delicious dark cocoa-rich chocolate that is sure to enhance the festive mood. 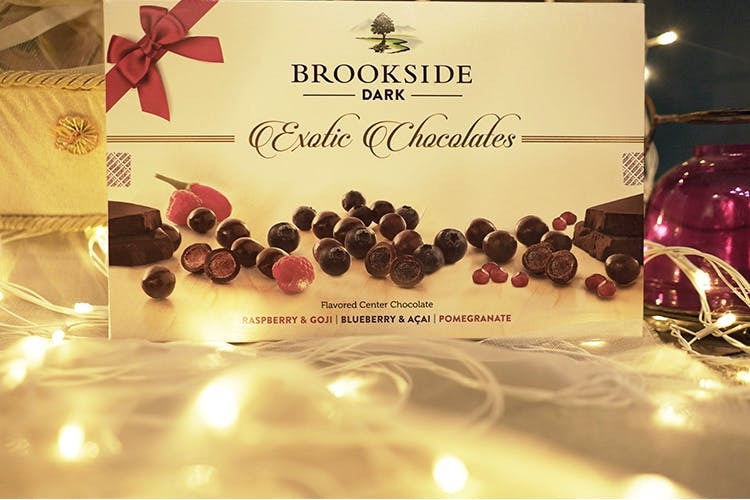 The Brookside Assorted Chocolate Gift pack consists of exotic fruit flavor combinations such as Blueberry and Acai, Raspberry & Gogi berries and Pomegranate, which we’re sure is going to a celebration at first bite. This makes for a perfect gift for chocolate connoisseurs for its premium taste and wine lovers, for when wine and Brookside dark cocoa-rich chocolate come together, the result is as sweet as its taste. Plan a small get together or a lavish dinner or maybe just gift them this chic gift box and get the Diwali party started. You can get your gift box at stores like Big Bazaar, Spencers, More, Dmart and others. You can also order online on Big Basket, Amazon & Grofers.